On Friday April 20th at Casa Sanchez Restaurant the Carmelite Sisters of the Most Sacred Heart of Los Angeles held their annual fundraiser dinner for Marycrest Manor, “For Greater Things!” This evening was a gratifying gathering of friends whose faithful support for our mission flows from the goodness of their hearts! The first hour began with a silent auction with a wide array of items and our guests busily bided in festive competition. The sisters also moved about selling tickets for an upcoming Dodgers game. The meal commenced in a prayer from our chaplain Fr. Al Koppes who encouraged all present to remember to thank God for all the blessings He has given. As the evening progressed our main meal was served in traditional Mexican flare! The enchiladas, fajitas, salmon, rice, and beans were a delicious feast that even Mother Luisita would have loved! As the dessert was served we were enchanted by a professional group of Mariachis that sang to us the beloved song “Atotonillco” and other hymns in traditional Mexican style. Then we were shown a video of the life of Mother Luisita followed by two resident testimonials. 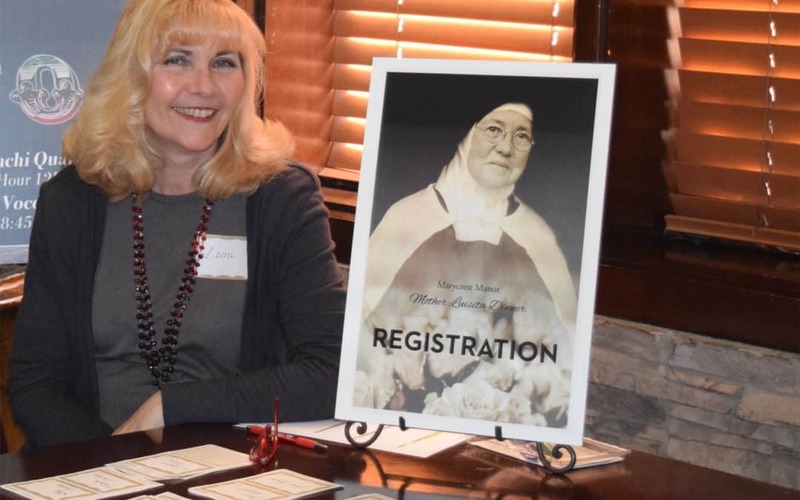 Sr. Mary Clare, our administrator, gave a beautiful witness of the tender roses that were the theme of the evening, and shared that each resident’s life if like a beautiful rose in full bloom in which we are privileged to partake. We were also blessed to hear the testimony of one of our family members whose mother resides at Marycrest. He shared from his heart just how much a blessing Marycrest is to his family. After these touching displays of the mission and heart of Marycrest, we were able to see a hilarious video about how to help the sisters in their next capital endeavor to purchase a new oven and steamer. The guests were touched in their funny bone and moved in their hearts to give generously to the cause. Finally, as the night came to a close the sisters sang a song of blessing to all the guests assuring each of them that they are held close to our hearts and always in our prayers. It was a magnificent night of joy and support of the mission of the sisters who serve at Marycrest Manor. We give thanks to our wonderful committee and for their great efforts to help us to make this evening such a success! See our slideshow!